I would venture to say that many of us got our start in genealogical research with the kind of handwritten notes on cemeteries I found in my grandfather’s box of family papers. 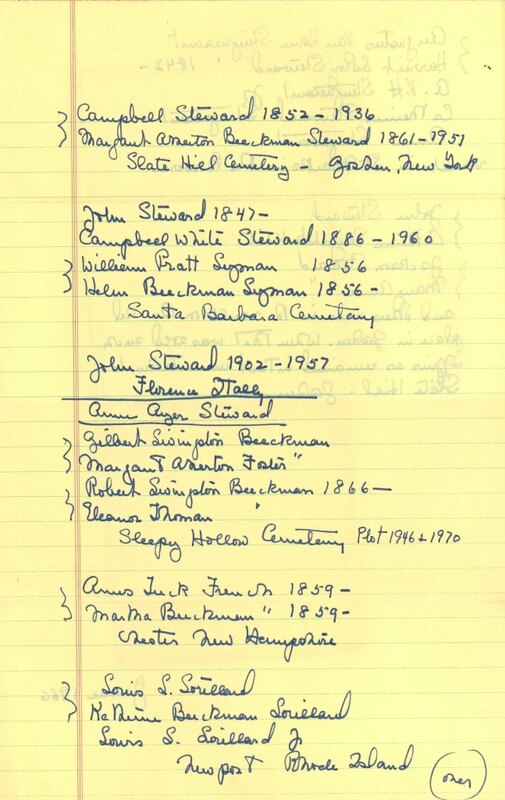 My great-aunt Margaret Steward (1888–1975) was the family historian, and doubtless it was at my grandfather’s request that she wrote out this long-hand list of places where family members were buried. Her list is invaluable, and yet it is also frustrating. As a beginner when I first saw this list, such a list of names daunted (and intrigued) me: who were these exotic Beeckmans and Lorillards and Stuyvesants? What were the connections between them? – obvious to Aunt Margaret, and to her brother, since the people listed were the Stewards’ parents and grandparents, uncles and aunts, with a sprinkling of cousins; yet, absent a key, a family mystery to future generations. 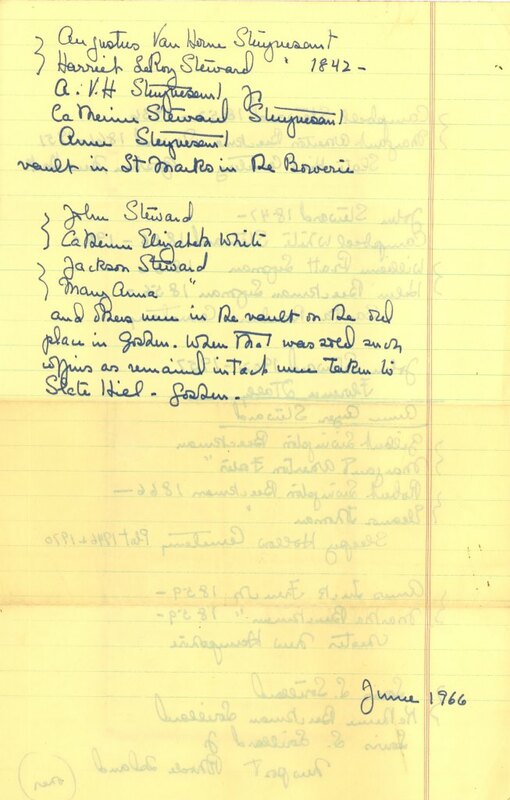 Aunt Margaret’s list is dated June 1966, and includes her two brothers (Campbell White Steward 1886–1960, buried at Santa Barbara Cemetery in California, and John Steward 1902–1957, buried in Florence, Italy). Gilbert and Margaret Steward’s parents are Campbell Steward 1852–1936 and Margaret Atherton Beeckman Steward 1861–1951, buried in the new family plot at Slate Hill Cemetery in Goshen, New York. Santa Barbara was a family hub in the 1920s and 1930s, so Campbell’s brother John Steward 1847– is also buried there, along with Margaret Beeckman Steward’s sister Helen Beeckman Lyman 1856– and her husband William Pratt Lyman 1856–. Oddly enough, Aunt Margaret doesn’t seem quite sure where her sister-in-law, Anne Ayer Steward, is buried. She is on firmer ground with her maternal grandparents, Gilbert Livingston Beeckman and Margaret Atherton Foster Beeckman, buried in Uncle Robert Livingston Beeckman’s plot at Sleepy Hollow Cemetery in Tarrytown, New York. 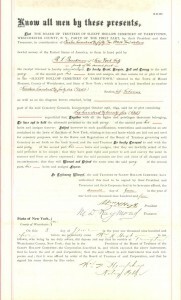 The youngest of Margaret Beeckman Steward’s sisters, Martha Beeckman French 1859–, is buried with her husband Amos Tuck French 1859– in Chester, New Hampshire, while the family of the eldest, Katharine Beeckman Lorillard, can be found in Newport, Rhode Island [sic]. 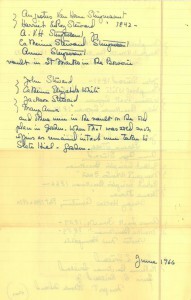 So here, on two sides of a sheet of legal paper, is a rich trove of family information – now complete with a key! He died in Rawlins, Wyoming, in 1923. 1908–1947. She is buried with my grandfather at Hamilton Cemetery in Hamilton, Massachusetts. 1866–1935. His first wife, Eleanor Nancy Thomas 1878–1920, is buried in the same plot. The former Martha Codwise Beeckman 1863–1951, named for her great-aunt Martha (Livingston) Codwise. The former Katharine Livingston Beeckman 1855–1941. She is buried with her husband Louis Lasher Lorillard 1849–1910 as well as their eldest son Louis L. Lorillard Jr. 1875–1938 at St. Mary’s Churchyard in Portsmouth, Rhode Island. 1842–1872. 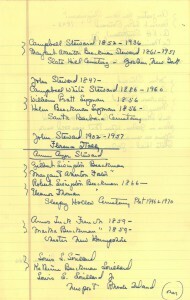 Also listed are her husband Augustus Van Horne Stuyvesant 1838–1918 and their children: Catharine Elizabeth Steward Stuyvesant 1865–1924, Augustus Van Horne Stuyvesant 1870–1953, and Anne White Stuyvesant 1871–1938. Their grandparents were John Steward 1814–1901 and Catharine Elizabeth White 1818–1867; their great-uncle Daniel Jackson Steward 1816–1898 married Mary Anna Bogert 1830–1912 in 1856. Scott, are you descended from Pierre Lorillard III and Catherine Griswold? If so, I believe we’re cousins. 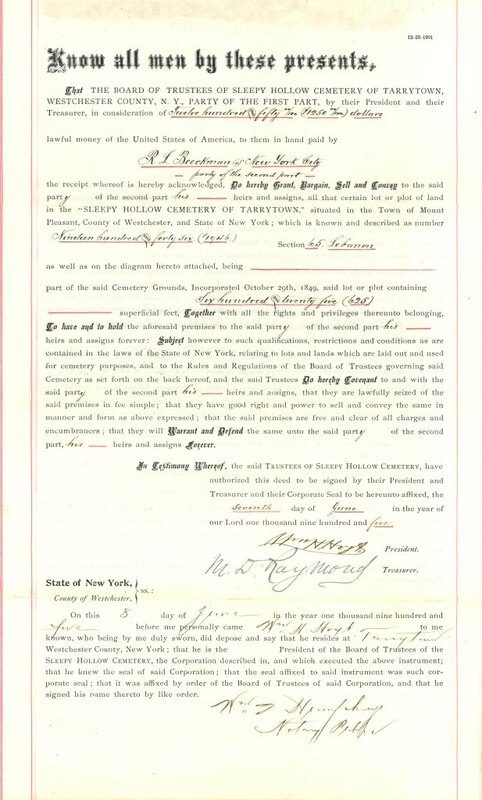 Grant, my great-great-aunt Kate Beeckman married their son Louis — so we have cousins in common! Thanks, Scott! We likely have ancestors in common, too. To add to the conversation. As the daughter of Louis Livingston Lorillard (1919-1986), my grandparents were Louis Lasher Lorillard, Jr. (1875-1938) and Edith Norman Hunter Lorillard (who married Irving Beebe after my grandfather died). Katherine Livingston Beeckman Lorillard (1855-1941) was my great-grandmother married to Louis Lasher Lorillard (1849-19100. My father was not a III, because his middle name was Livingston. We are direct decent from Pierre Lorillard III and Catherine Griswold Lorillard.